If an animal has had to be PTS then surely it would have had done by a vet. I am wondering if SSPCA would investigate this at all. Not necessarily unless it can be proven that the animal’s welfare had deliberately been put at risk. All they can do is serve a notice of warning to improve matters within a certain amount of time and then take animals into custody if this does not happen. As long as animals are being fed/watered, looked after appropriately with proper shelter and are kept free from avoidable pain, injury, suffering and disease then their hands are tied. They will only take animals if their welfare is in immediate danger but if there are 170 animals finding places for them within the Drumoak rescue centre would be nigh on impossible unless other REPUTABLE sanctuaries (of which there are a few in Aberdeenshire/Angus/Morayshire) can step in to provide assistance (although they all have the welfare of their own animals to put first) but seeing how these have all been shunned by the Cables in the past I can see no reason to help them apart from the fact that none of us wish to see an innocent animal suffer. Without doubt the Cable family have overstepped the mark this time. Personally, I have no doubt that this incident was originally nothing more than a case of unfortunate circumstances. Let’s face it, incidents with unsecured food stores and Shetland Ponies are hardly unknown. However on this occasion, their talent for sensationalising events in order to maximise sympathy for themselves, possibly in the hope of securing some donations from their savant followers has hopefully backfired. It would appear that in order to avoid any possible blame being laid at their door for yet another animal death at their so called ‘haven’, they have concocted what they consider to be a suitable cover story blaming ‘haters’, mysterious ‘activists’ and even alluding that AV’s Suzanne Kelly is to blame and actually responsible for this supposed attack on their ‘haven’ is to say the least disgusting and I hope that this is taken seriously by the appropriate authorities and investigated by the Police, the Scottish SPCA and the governments appointed animal welfare agency in Inverurie. The scary thing is that the Cable family are unable to accept being wrong in any shape or form. Their default response to anybody questioning the things they do is either denial or deflection. If that does not work, then Step 2 is to intimate that the person commenting is a ‘hater’ or a ‘Vegan’ or cast aspersions on their character in the hope that they back off. Step 3 is to suggest that police or solicitors are going to be involved in the belief that most people will not pursue the matter in case they end up in an expensive court case. Step 4 has now been auctioned. Stick their heads in the sand and shut down communications with the outside world until their critics get bored and go away. I don’t know about you, but I do not feel the need to lose interest in this particular ‘can of maggots’. These people need to be exposed and prosecuted! Suzanne says – thank you for this comment Peter. Readers should know that quite a while back Peter read one of my articles on NAH, and sent in questions for me and for Kelly Cable. I answered him with facts; and pretty much since that time, Kelly Cable and NAH supporters have subjected Peter to a considerable amount of abuse for his trouble. I hope you keep us all updated as to any further actions either NAH make, or you personally have to make? I feel that these are potentially dangerous people. They do not appear to have any boundaries! My concerns are not only limited to the animals in their care, but to the deluded people who they have sucked into their supporters group. It seems to me that the Cable’s take advantage of people, some of whom may have special needs. These people may possibly be in need of support as well. As predicted in my previous post. Please see above. Step 2 was used first, intimating the ‘enemy’ is simply a fool. 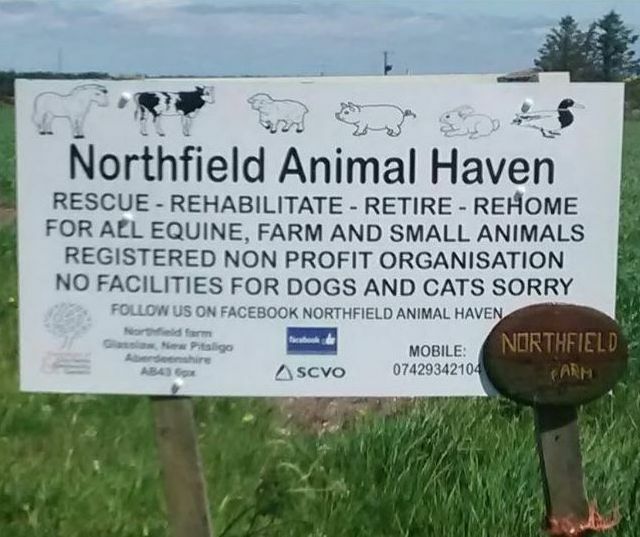 I see that steps 3 and 4 have been actioned by Kelly Cable at Northfield Animal Haven. I have no idea where the references regarding another daughter is concerned. Perhaps one of her supporters who follow this page would care to clarify? I can not speak on behalf of AV but I am confident your comments WILL be published. I have no idea of the threats made to her last year other than her stating that threats had been made. Again I would like to see a direct quote of these threats. Finally Kelly has published that she would rather put her animals to sleep than let other sanctuaries take them. She is right about one thing. The animals in her care are her responsibility, and for any of them to die in such dubious circumstances as has been described and for that not to be reported to the police, should be considered as an act of gross negligence at the very least. I am not very knowledgeable about these things, but perhaps there is someone reading this who knows how to set up a fund to finance Suzanne or AV to make this a reality? These people need to be publicly shown as the frauds that they are so that good people are not taken advantage of any more! Thank you Sammy McQueen for clarifying the picture. It was not AV or Suzanne Kelly who made any comment regarding you having another daughter. It was simply a genuine comment from the general public that you have used to try and mock the reporter…..nothing more than a case of wrong identity by the poster which you and your family have pounced on to try and deflect and belittle the article. Gillian Louise Tosh – I read a lot about genuine animal charities and never hear about the kind of dishonesty perpetuated by your mother and her organisation.